Nothing says October and Halloween more than the mighty pumpkin. Basically a squash from the Cucurbita family, its cousins are all types and shapes of squash as well as the cucumber. Pumpkins are prolific here in October—you’d think they had their roots in American Indian culture, but six of the seven continents grow pumpkins. Antarctica can’t grown them, but Alaska can! 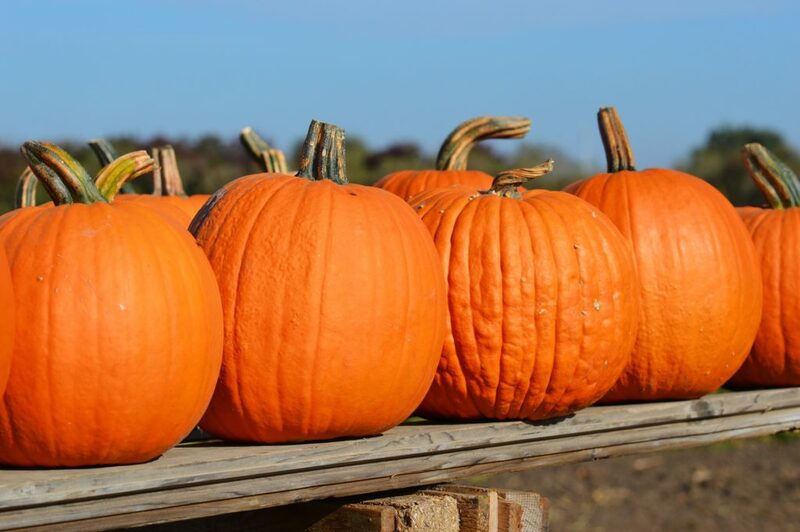 Morton, Illinois is the self-proclaimed “pumpkin capital”—no doubt because Libby, a division of Carnation Company, grows their pie pumpkins on 4,000 acres in five counties in Illinois. They are grown by private farmers, then Libby sends in their own crews and equipment at harvest time during which they process 500,000 pumpkins a day from October to January. Conservatively, that’s over 42 million pumpkins! Carving pumpkins is actually an Irish tradition! The great Irish immigration of the 1840s brought over 500,000 potato farmers to America after their crops were wiped out from a devastating fungus. With the Irish came their tradition of carving scary faces onto turnips or potatoes and placing them in windows or near doors to frighten away “Stingy Jack”, a wandering evil spirit. Jack invited the devil to have a drink with him, but didn’t want to pay for his drink. He convinced the Devil to turn himself into a coin that Jack could use to buy the drink. But Stingy Jack put the coin in his pocket, preventing the Devil from changing back into his original form. Jack and Devil then cut a deal: if Jack freed the Devil, the Devil wouldn’t bother Jack for a year, and should Jack die, he wouldn’t claim his soul. The next year, Jack tricked the Devil into climbing a tree to pick a piece of fruit. While the Devil was high in the tree, Jack carved a cross into the tree’s bark to prevent the Devil from climbing down without first promising Jack that he wouldn’t bother him for ten more years. Not long afterwards, Jack died. God wouldn’t allow him to go to heaven, and the Devil had agreed not to send him to Hell. So Jack wandered into the night, lighting his way with a coal placed in a carved-out turnip — and has been roaming the world ever since. In America, the Irish found pumpkins more plentiful and easier to carve than turnips, so their Jack-of-the-Lantern (or Jack O’Lanterns) simply became pumpkins. Pumpkins are 90% water, fairly easy to grow, and are rich in potassium and Vitamin A. Their flowers are edible. It is believed that pumpkins originated in Mexico and Central America and explorers brought them back to their native country. During the autumn season, the pumpkin is creatively used in interior landscaping, as well as on porches and gardens everywhere.